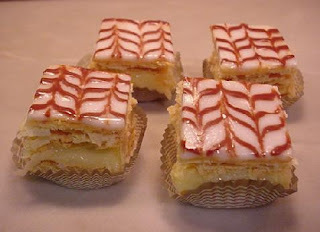 Working as a French Pastry Chef I am beginnig to see the classics coming back. One of these happens to be the Napolean. This is a classic French dessert recipe that never fails to impress! The French name for a Napoleon dessert is Mille Feuille, meaning "a thousand sheets" acurately describing this layered crispy puff pastry lined with a contrasting butter cream filling… absolutely delicious and oh so satisfying! You can prepare this dessert individually or as one large rectangular pastry.